The hammer strikes down dramatically, ringing deep and continuous. A piano, alone, carries a melody to our hungry ears. Within moments, it is joined by the light caress of cymbals and overdriven guitar. All of this, resinating with orchestral strings, leaves us feeling small among its immensity, but anxious as to what awaits. 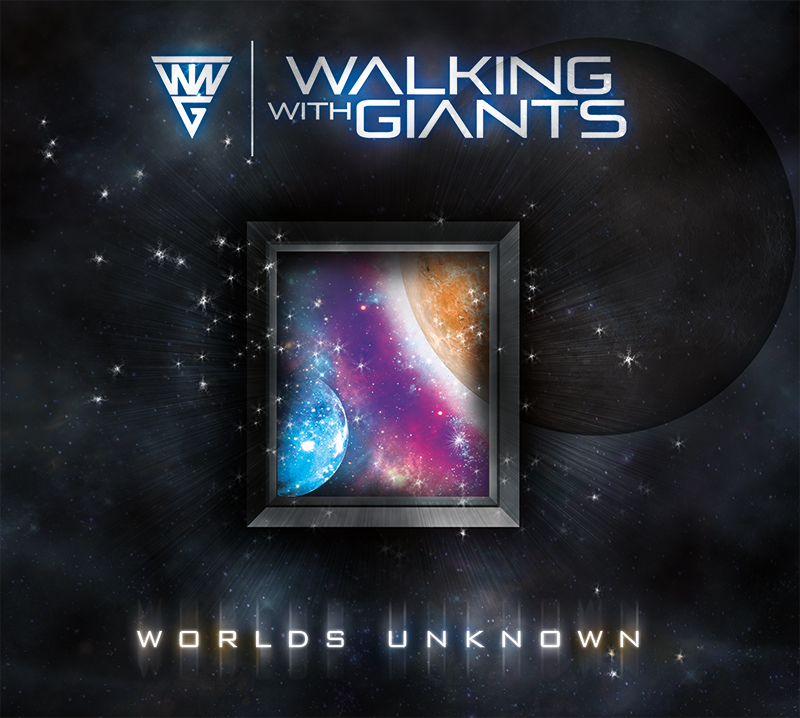 And thus is the start of Walking With Giant’s third offering, but first full length effort, entitled Worlds Unknown. This January 15 release finds frontman Gary Noon, and his studio team, firing on all cylinders. For those that haven’t been made privy to that great secret which is Walking With Giants, allow me to spill the beans. This Baltimore-based entity is the brainchild of guitarist and vocalist, Gary Noon. With dreams of playing with his heroes, he reached out to Sevendust’s Clint Lowery, as well as Alter Bridge’s Brian Marshall and Scott Phillips, collectively composing two breathtaking EPs, Walking With Giants and One By One. Though Phillips had scheduling conflicts and was thus unable to perform on the team’s first full length album, Sevendust’s Morgan Rose has taken up the sticks without missing a beat. While Noon and company continue to provide us with a buffet of irresistibly addictive hard rock tracks, the new release is different in that A) it’s longer, and B) it’s buttressed by two halves of the title track. In between the bookends entitled “Worlds Unknown” Parts 1 and 2, we are enveloped in a series of songs that overflow with positive energy! “Broken Truth” and “Back To Life” lift the spirit in tone alone, while hard-hitting powerhouses like “Bound” and “Heavy Hand,” despite dealing with personal struggle, shine through the darkness with words of determination and perseverance. Perhaps the first track that breaks from this mold for Walking With Giants is the tune entitled “Guilty One,” in which Noon struggles with the feeling of being at fault. It takes a strong person to take responsibility for their actions, but the important thing about this song is that though he is made to feel at fault, he never admits defeat. These uplifting lyrics are one of the defining points of Walking With Giants that continue to draw me in time and time again. Watch the “Heavy Hand” music video here!